Just yesterday I watched a blond-haired mom smile weakly at something witty the receptionist said and reposition her son’s bald head on her shoulder. The little guy whimpered and cuddled in closer. He was around three years old and his bare head showcased a huge scar arching over his right ear. He settled back in quietly as his mom adjusted the medical line from his nose. I was speechless. I couldn’t quit taking peeks at them from the corners of my eyes and I could think of absolutely nothing to say. I’ve written blog posts about how to help cancer caregivers and I remember vividly how hard it was to sit in silence sometimes. But I couldn’t speak to her. I knew her struggles and recognized the stage of treatment the boy might be in and I could not speak. My strapping, healthy 14-year-old cracked jokes by my side while we waited in the pediatric oncology/hematology clinic at the Children’s Hospital. 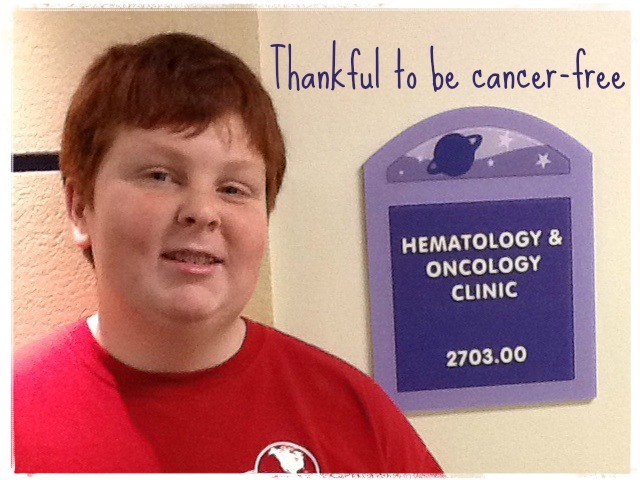 We were there for a wellness check—I had no worries at all that the oncologist would find anything but sheer health in my cancer surviving boy. This was a follow-up. A he’s-been-out-of-cancer-treatment-for-almost-seven-years celebration. But I found it difficult to swallow and the queasy feeling I remember so well from treatments starting ten years ago made itself at home again in my middle. That woman, sitting there cuddling the boy in the midst of their storm struck such a chord in my heart. How many hospital rooms had I sat in while cuddling a bald boy who didn’t feel well? I found myself praying for this little stranger-who-seemed-so-familiar and for his mom, who carried him into the inner sections of the cancer ward during my prayer. We went inside too, where my son laughed and joked with the oncology staff. My son who fist pumped when measured at an official 5’9” and passing me in height. My son who is on the honor roll at school and plays basketball with joy. I find myself today feeling incredibly blessed. As I begin cooking for a thanksgiving meal with all three of my healthy children home and laughing together, I find myself praying that the blond woman from the cancer ward gets to have a thanksgiving meal with all of her healthy children present. Maybe seven years from now she’ll sit in a cancer clinic waiting room, praying for another mother who is cuddling a bald child. Or maybe, cancer won’t be a medical issue any more. Wouldn’t that be great!